All carpets are rugs, but not all rugs are carpets? In today’s Oriental rug and carpet market, it is typical to use these terms interchangeably; however, these terms were not always so relaxed. The United States rug and carpet markets do not clearly distinguish between the two Oriental groups, and many other countries no longer adhere to the slight terminology differences when describing a rug or carpet in their own markets. In its intended classification, carpets are rugs that have a surface area less than 4.4 meters squared (approximately 14.5 feet squared) and a length less than 1.5 times its width. For example, a carpet could be 15’ by 10’or 9’ by 6’ in size and meet the ‘carpet’ guidelines. In other classification styles, carpets and rugs are distinguished by their traditional designs. Depending on where the rug or carpet was produced, the traditions and culture of the area could influence what the product is called. For example, prayer rugs that originate in the Central Asian area are never referred to as carpets. Carpets are often seen as less sacred and more common than rugs, which is why calling a prayer rug would be disrespectful. On the other hand, carpets encompass anything with a hunting design and would not be referred to as a rug. With those few exceptions, even experts use the term rug and carpet interchangeably. Although it is common for experts to refer to a specific area’s weaving products as a rug or a carpet because of the culture’s traditional export, it does not necessarily mean that that specific item follows the above technicality of the rug or carpet term. Technically, runners and strips are rugs that describe very long and narrow products. These three terms are often used synonymously, and there are no real distinctions in weaving culture between the runners and strips. It is common for runners to refer to very long and narrow products, while strips are much shorter. For example, runners are usually used in hallways, whereas strips are used under a table. The term ‘mat’ refers to a very small rug, usually 2’ by 2’ or smaller, and is more of a decoration piece instead of a floor covering. 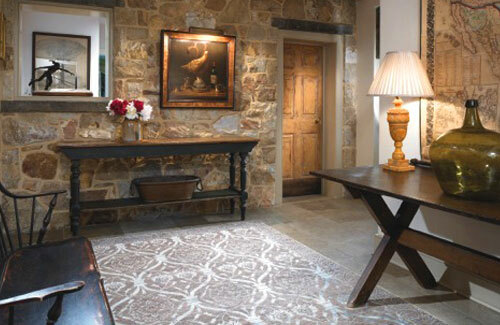 For more examples or Oriental Rugs and Carpets, visit our showroom!